Promotional Products & Marketing Blog » Customer Stories » Need Golf Giveaways? Think Beyond Golf-Themed Promos. Need Golf Giveaways? Think Beyond Golf-Themed Promos. When you think about golf giveaways, the tried-and-true promos likely come to mind: golf balls, tees, towels. These are all great. They’re useful, effective, and right in line with a golf event. You can’t go wrong with golf-themed swag at a golf event. It just fits. But here’s a new idea for you: custom sports bottles. These may not be par-for-the-course promos when it comes to golf events, but they work. They’re something different from the expected giveaway. Sports bottles stand out and get your brand remembered. People always appreciate receiving something they can use, and sports bottles are one of those items that are so convenient to have on hand. 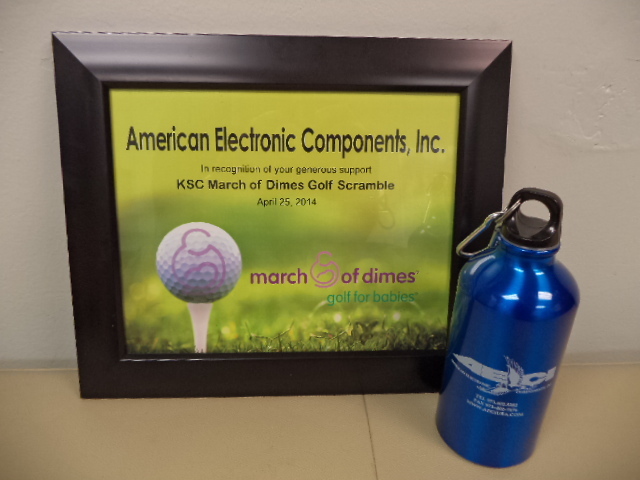 Our client, John Ryff, General Manager for Ormond Beach, Florida-based American Electronic Components, Inc., decided to take a swing with custom sports bottles, handing out more than 100 at a March of Dimes Golf Scramble. 1. The water bottles were perceived as thoughtful gifts. Presentation matters. Recipients should feel like they’re getting something special – not just being handed a freebie. Ryff placed his company’s logo sports bottles in gift bags, which were then positioned on golf carts prior to the event. 2. The sports bottles were functional and visually appealing. You want your promotional giveaways to serve a purpose and also look good. The vibrant blue aluminum sports bottles Ryff selected immediately catch the eye, and they’re designed with a carabiner for attaching to a golf bag. 3. Golfers appreciated receiving the bottles. Any time you hand out a custom logo product, you want recipients to be happy receiving it. The sports bottles hit the mark perfectly. “We were approached by many who said the sports bottles were a terrific gift and that they were very pleased with them,” says Ryff. When it comes to golf events, you’re not limited to golf-specific items. As long as your promotional giveaways make sense for the event and your brand, take a swing at doing something new. You might just find yourself with a hole-in-one promo. Golf Season Is Here…Is Your Business Ready?